We’re all of a flutter here at ABC and thanks to our friend’s at Norwich Theatre Royal, you could be too! This month we have two tickets to giveaway for the eagerly anticipated Valentine’s Day showing of ‘THRILLER LIVE’. If that wasn’t enough, we’re also including £30 worth of ABC Taxi vouchers, so you won’t miss a single beat! Direct from London’s West End, THRILLER LIVE is a spectacular concert created to celebrate the career of the world’s greatest entertainer. ‘FOUR STARS’ The Independent ‘AN EXUBERANT BLAST’ Daily Mail. The competition will run from 12.30pm Monday January 17th to 12.30pm Tuesday January 31st. The winner will be notified via a direct message by 5pm on the day the competition closes. Failure to reply to the winning notification within three days renders the competition void and another winner will be chosen. The winner’s name, address and contact details will be requested for prize fulfilment. 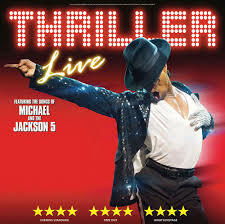 Prize includes one pair of Thriller Live tickets on February 14 at 7.30pm and £30 ABC Taxi vouchers.